First, my apologies to Meg and all the participants in P2P2 for being late – poor management of time and energy yesterday. I’m really sorry. This is my finished project together with the calendar reproduction of a John Bellany painting. 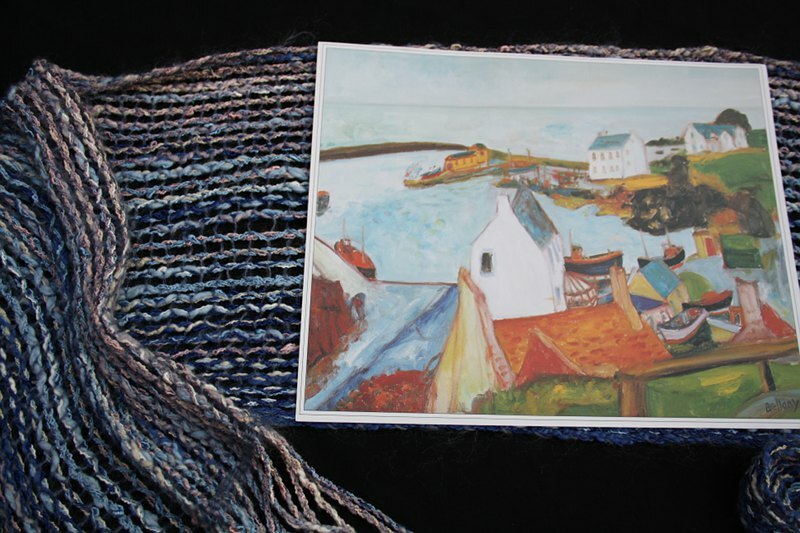 Read here about the story I based on the picture and the idea of a scarf that blended in with the colours of the sea. There’s gruesome detail about the weaving structure here. After sampling a series of wefts, and totally ignoring my previous statement that wool and mohair were too fluffy and warm for this project, I chose Fine Kid Veloute from anny blatt, 51% wool, 49% mohair, in a lightish blue-grey. The colour was perfect, the grip gave some needed stability to the structure, and the fuzz reminded me of a light mist over the water in the morning. 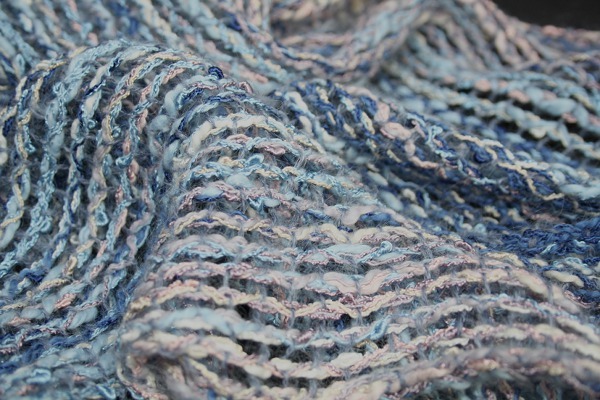 The combination of the viscose/cotton warp, wool/mohair weft and leno structure has produced a light, softly draping scarf that feels lovely to wear and, I think, fits the watery theme. This photo shows the status of the second P2P2 project I hoped to finish, plus part of the reason for the delay. In the background (how appropriate!) is the warp beamed but not threaded. In the foreground is a folding table I’ve put up to hold some of the overflow of tools and materials for my OCA course. On my main worktable (definitely not shown!) are more tools and A Space (many exclamation marks) for using them. I’m having a blast working on the course, but naturally time, as well as space, is at a premium. So this is what I planned (and still intend) to do. I’ve previously blogged about this sample here and here, and my reactions to the inspiration photo here. The draft is on the right and will require rather a lot of imagination. First, ignore the bottom part with the squares of floats. That’s from Sandra Rude’s article “fulled merino scarves” in The best of Weaver’s: Fabrics That Go Bump. I’ve wanted to make it in this yarn for ages, so figured a threading and wound a warp to suit both. 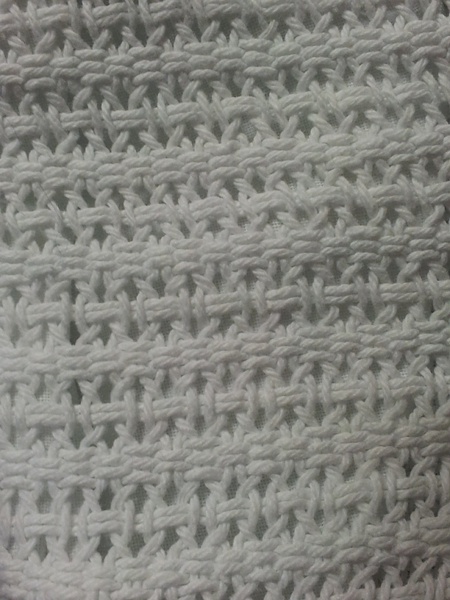 The top part shows a plain weave base in white cashmere/merino. The yellow stripes, evenly spaced and regimented, are a supplementary warp in shiny gold that will weave plain weave along with the base. You can see a hint of such a stripe near the right edge in the sample photo. The pink threads in the draft are a supplementary warp using Filatura di Crosa Luce yarn, a 40% rayon, 30% cotton, 15% kid mohair, 10% polyamide, 5% acylic blend that can be seen the third wriggle from the left in the sample. It’s threaded in groups of 3 – 2 – 1 – 1 (right to left), so regularity of a sort, sometimes aligning with a gold stripe sometimes not, but bobbling around all over the place. I don’t know how it will look in practice – I think there’s a strong possibility that it’s lots of ideas that don’t work together as a design. 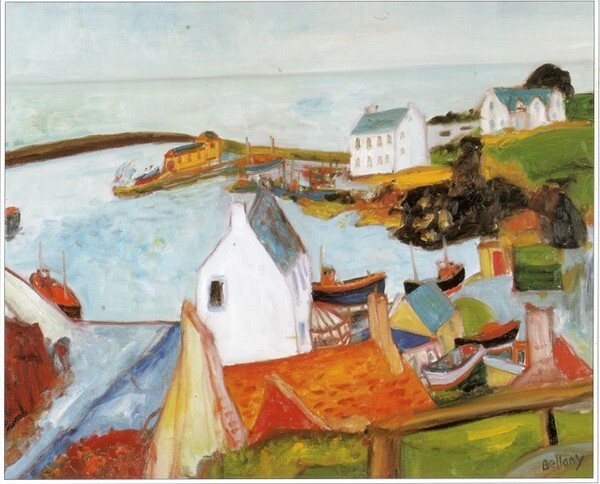 The ideas are – free spirited, feathery spots of colour and texture, fiercely and exultantly individual (the multicoloured supplementary warp and the trombone guy). The base cloth is plain weave, very sensible and stable in a quality, even luxury, yarn, with regular stripes (clock-like regularity??) of gold (stashed in a bank account??) – being various aspects or caricatures of swiss people, products and facilities. The individual is experiencing freedom, but is actually one of a group (the band in the parade), working within a structure and constraints (swiss society and caught in plain weave even if it floats above). It seems very ponderous when I type it out. Many thanks to Cally for a great set of photos and to Meg for making it all happen. I’ve really enjoyed being part of P2P2. 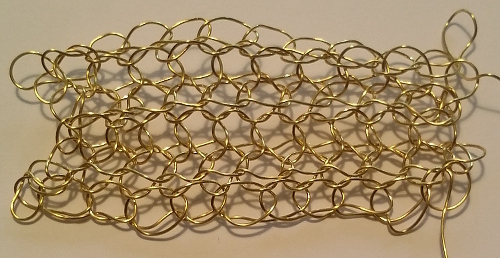 While I’m busy doing, correcting and redoing my sums for the next warp, here is a previously unblogged project I completed last November (about the only thing I managed in Liz Calnan’s class at the Guild that term). 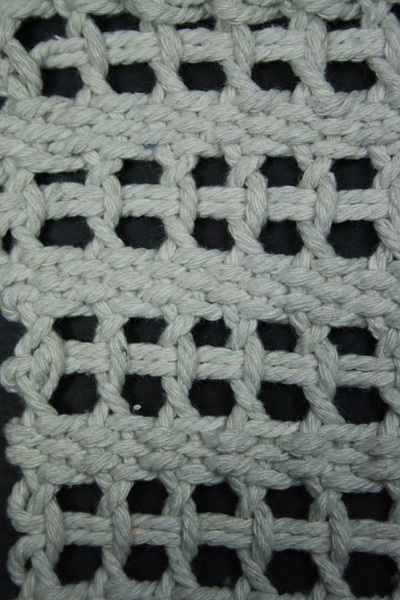 Scarf details: warp Bendigo Woollen Mills 2 ply wool. Weft Bendigo’s Mirage, a mohair / wool / alpaca mix that seems to have dropped from their line. 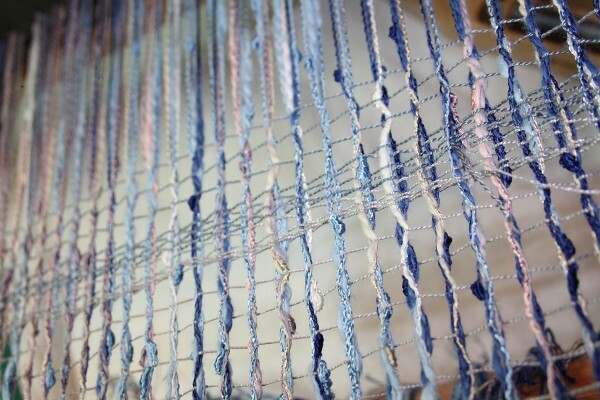 The warp is in stripes – plain weave and leno. 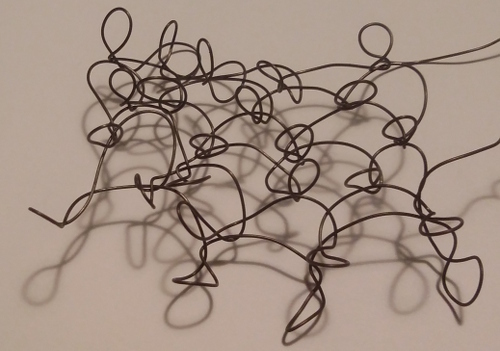 From Liz’s notes, “Leno is an open weave structure, with warps twisted around one another”. Pictures could help. 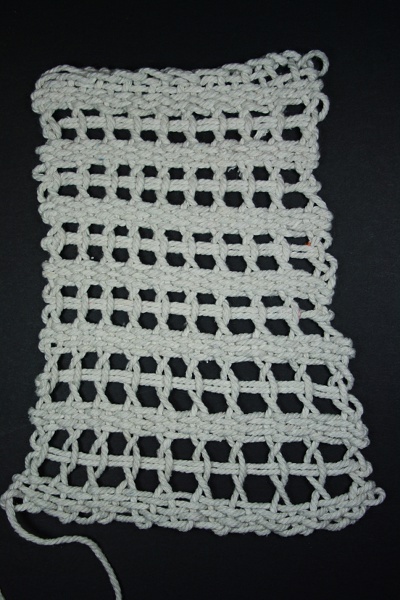 This is from the first little sample I did, using the scrappy yarn bit at the beginning so it is easier to see. Ignore the “oopsie” bit! One is the sample, the other the same photo with markings added. 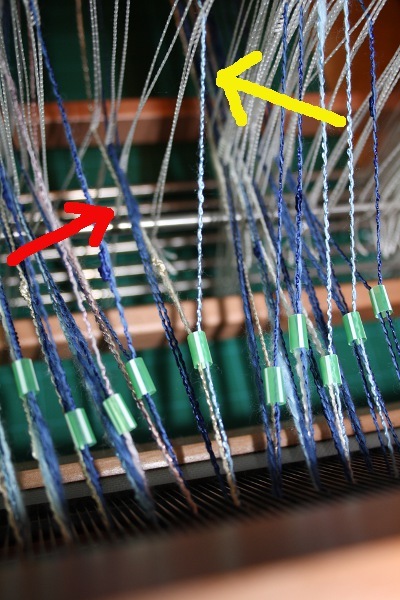 Looking at the markings, in blue and orange at the right we have two standard plain weave warp threads. 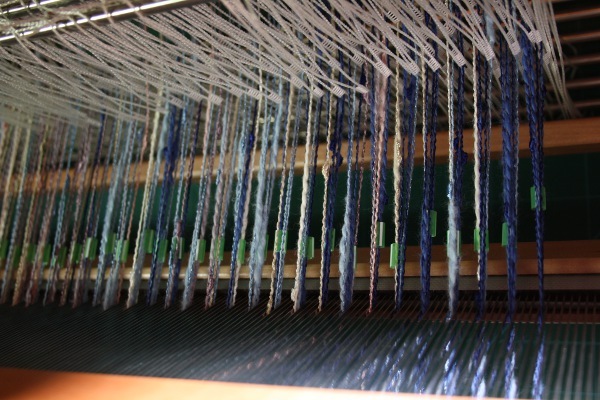 They sit nicely side by side ignoring each other, each one going under and over weft threads. In green and pink we have two pairs of leno warp ends. While weaving the green thread of each pair was pulled under the pink thread and up to form the shed. The weft was put across, holding that twist. 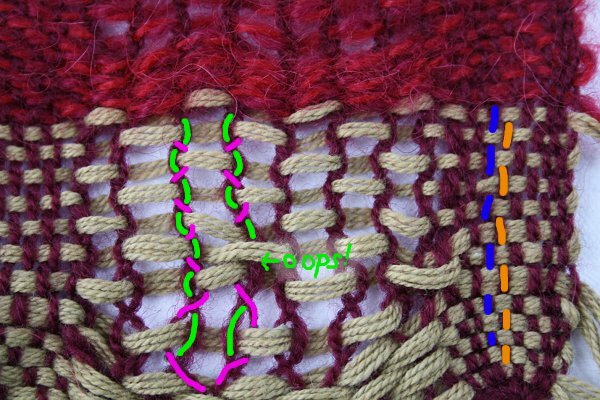 Then the green thread was allowed to return to its normal position next to the pink and up – another weft across, and that position is fixed. I set up the pairs so that in one the green starts on the right of the pink but is repeatedly pulled to the left then allowed to return to the right, while in the other pair the green started on the left and is repeatedly pulled to the right. The green threads wobble left and right over the weft all the way down the cloth. 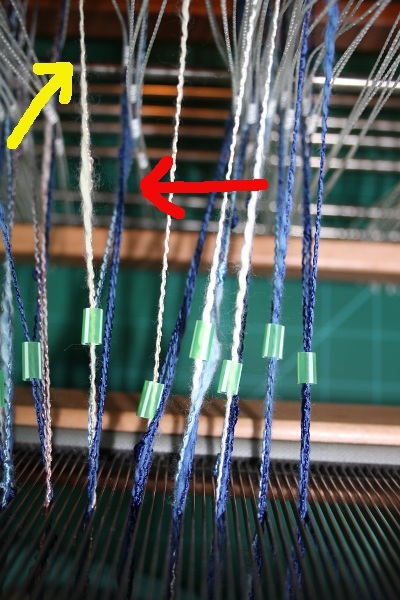 The pick threads wobble around, always underneath the weft. The weft holds in the wobbles. This allows a very open but still stable cloth. 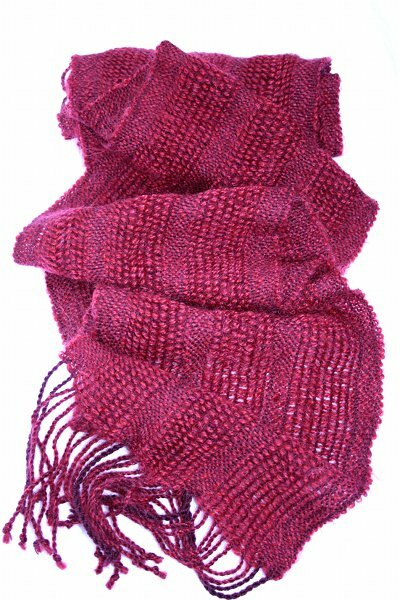 In this particular scarf the weft is the star, and the leno area adds a lot of textural interest. 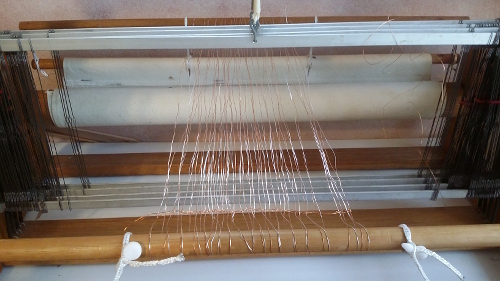 Liz had a bundle of samples, many with the wriggling, wobbling warp threads the main interest. 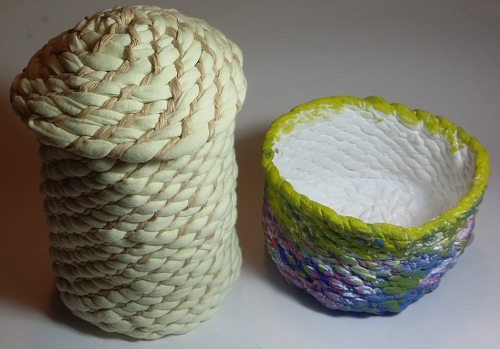 Different relative sizes of yarns give very different results – a huge area to explore (yet another!!). 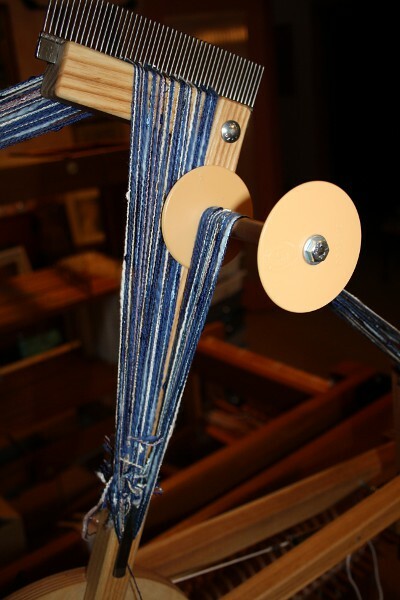 There are a number of ways to pull the warp threads out of their position and form the twist. 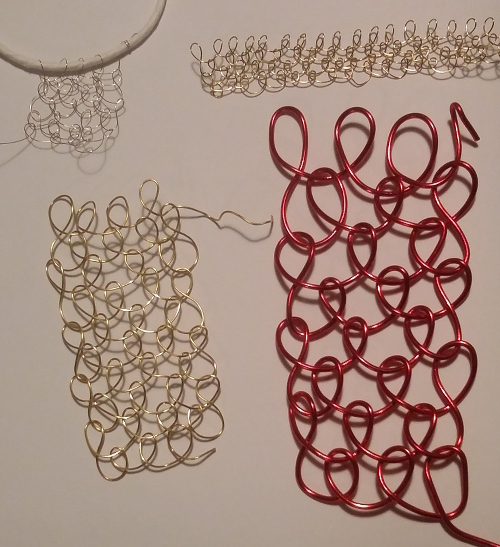 First, simple and flexible, is doing it by hand, as in my sampler of finger-manipulated weaves. 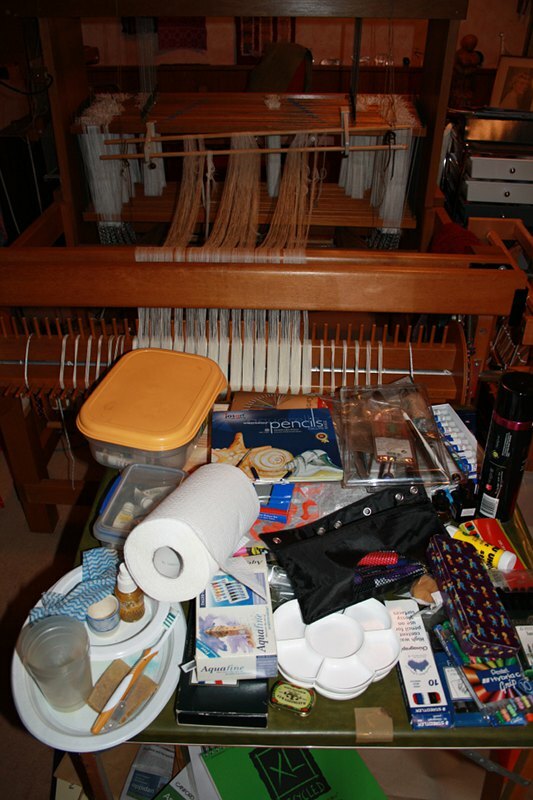 There are some good photos and explanation in Robyn Spady’s article on Weavezine. 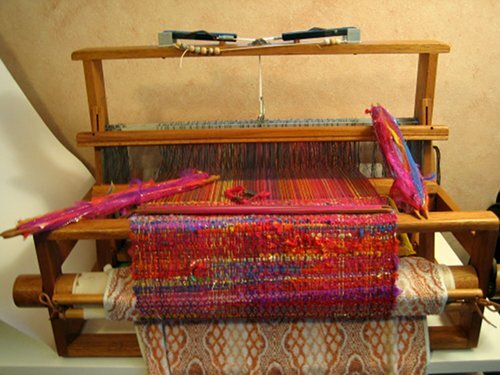 Bead leno uses beads or pieces of drinking straws to connect two warp ends – when one is lifted, it pulls the other with it – I think! That’s based on an article by Kathryn Wertenberger in the November/December 1989 issue of Handwoven. I’ve also seen photos on a few blogs – here and here. I used a third method – “doups”. 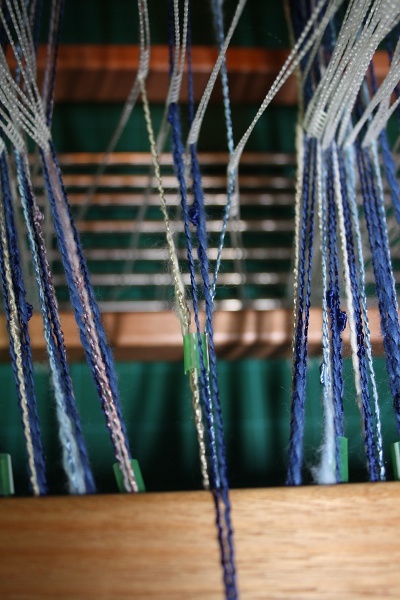 A doup is a carefully measured loop of yarn, say a nice strong cotton. I was going to try some diagrams, but why re-draw the wheel? 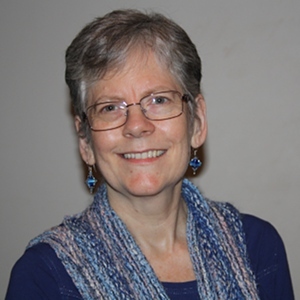 Check out Irma Spaargaren’s article on Weavezine. In words, the pink thread is stationary. It just sits there and the weft passes over it. The doup is attached to a shaft, goes underneath the stationary pink thread and loops around the green thread on the far side. For one pick the doup shed is left down, the green thread is lifted in the normal way and the weft passes beneath it. For the next pick the doup shaft is lifted. The doup pulls on the green thread, taking it underneath the pink thread and up. 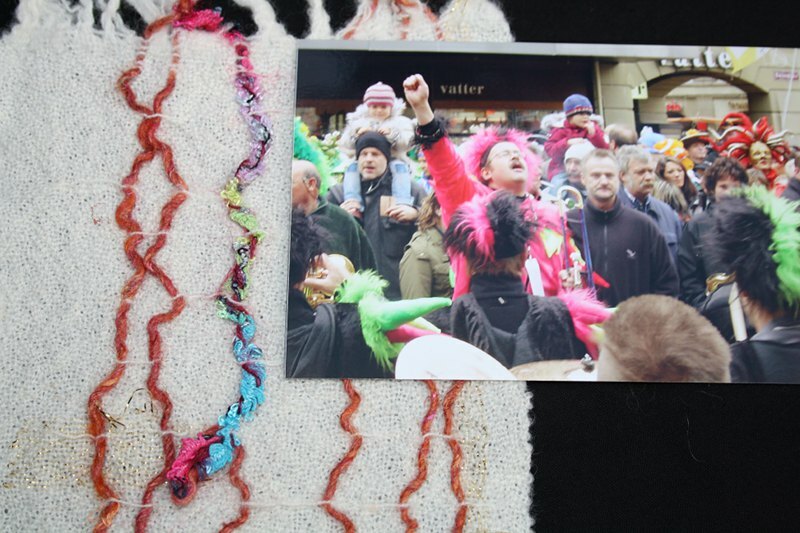 The weft goes over the pink thread and under the green one – but this time the green is on the other side of the pink. Repeat as required. * doup length is vital. It needs to be long enough that it doesn’t prevent the green thread’s standard lift, and short enough that when it pulls the green thread around and up you have a shed big enough to get through. And if your doups are slightly different lengths your shed and life will be miserable. * denting. I don’t know a general rule. 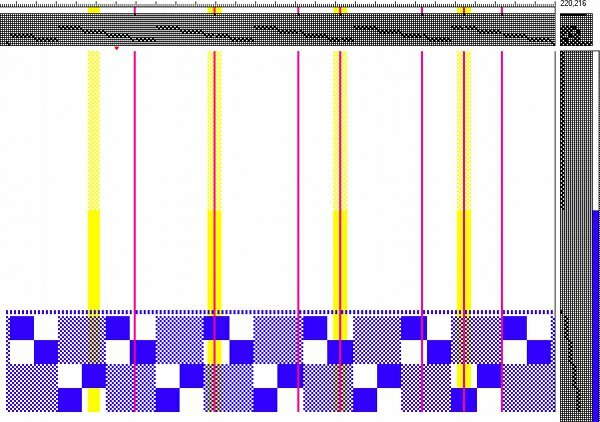 In my project the plain weave was set at 12 ends per inch in a 12 dpi reed – wider than I normally would for the yarn, but I was considering the weft and the overall light goal. The leno pairs were in separate dents next to each other, with 3 empty dents between each pair. 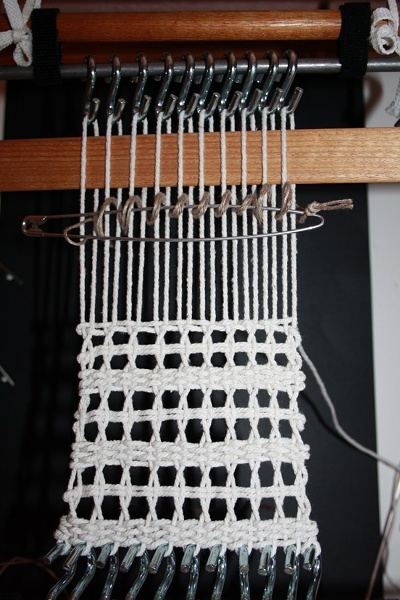 However no gap before the last pair and a plain weave area – I didn’t want the plain weave spreading out. 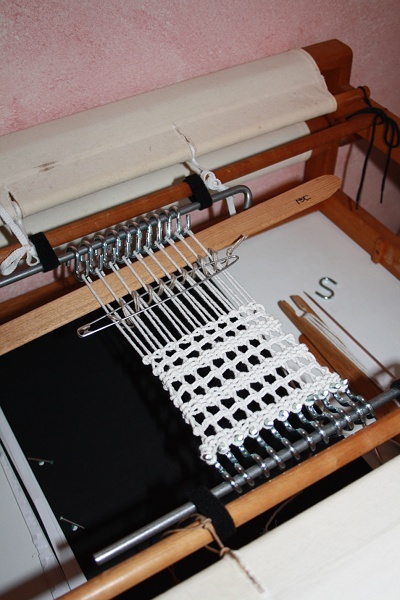 * I used my ashford 8 shaft table loom. I had the plain weave threaded on shafts 5 and 6, the leno pairs on shafts 7 and 8 and used shafts 1 and 2 for the doups (in Liz’s notes this method is from Monograph 32 – Tacker and Skowronski. The doup is attached to shaft 2 and goes through a heddle on shaft 1 before looping around the green thread). In theory it gives a slightly better shed, but the way I set things up, shaft 1 pressed against shaft 2 and tended to push it up, giving a teeny tiny shed. I ended manually pushing down on shaft 2 (tried weights but didn’t have the space), then using a pickup stick to clear the shed on ever second pick! It still grew quickly, given the grist of the weft and the light/loose nature of the design. 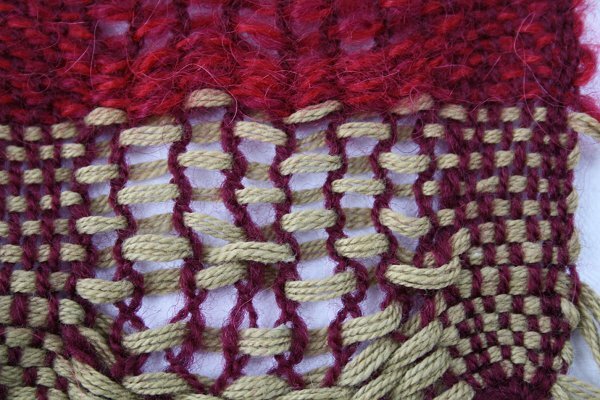 I really like the end result – a nice combination of various reds, some sheen and some fuzz from the weft mix, lots of textural interest, very light… and I’m expecting very warm given the air pockets – but there’s still a way to go before I give it a try. Sydney has rather a short scarf-wearing season.